The last place we went was HMV aka. heaven. I've found some amazing new bands recently and I wanted to get some more of their music, so naturally I went to HMV. I know a lot of people don't buy CDs now and do it all digitally but I personally love actual physical CDs so I buy them as much as I can. HMV is going out of business so I make a real effort to buy from them when I want a new album. When I went in I had a list on my phone of about 10 bands I wanted to look for but the range was kinda crappy so I only found a few, and due to a lack of money I could only afford one. Luckily it was the one CD I wanted the most: Free by Twin Atlantic. Twin Atlantic are amazing and Scottish and passionate and asdfghjkl I just love them. Free was only £5.99 as well which is awesome. Twin Atlantic!!!!!! LASDKJFL;ADSKFJ;LADSKJF is all there is to say. Love the bag and shoes! 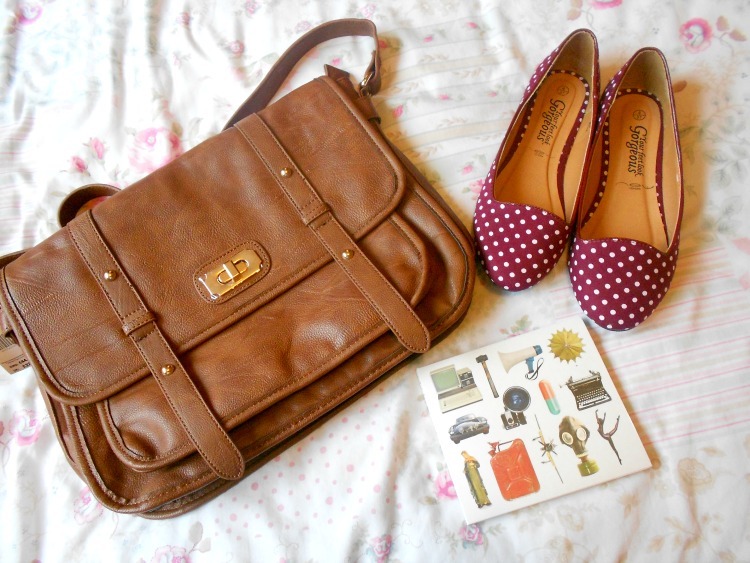 My new schoolbag is also from Accessorize :) and New Look shoes ... are the best. Not gonna lie.